The hotel "Villa Leto" was opened in July 2018. 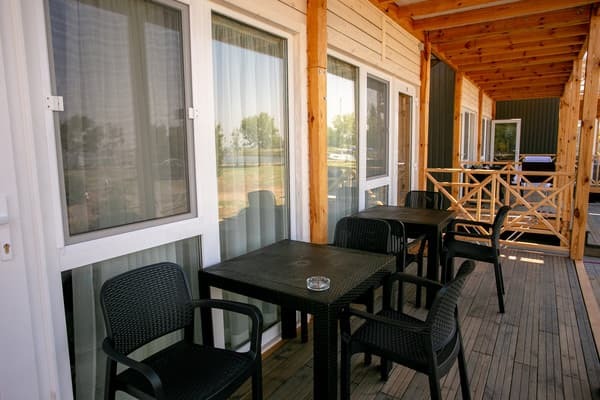 The hotel complex is a cozy two-storey cottages with a wonderful view of the Berdyansk Bay and the city of Berdyansk itself. At your service are offered 8 "Lux" rooms with an area of ​​27sq.m. with one bedroom and 4 family rooms with an area of ​​54sq.m. with 2 bedrooms. 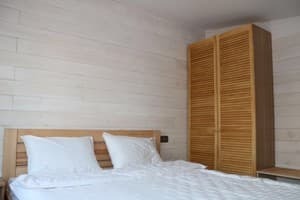 Each room is equipped with one or two double beds, a sofa bed, refrigerator, kettle, air conditioning, TV, fully equipped bathroom. 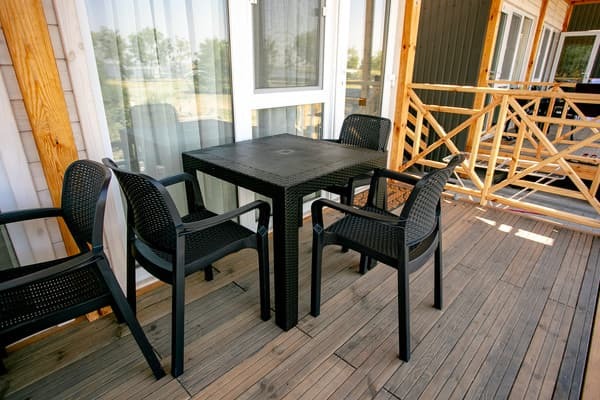 Description of the room: We offer you a family room with an area of ​​54sq.m. 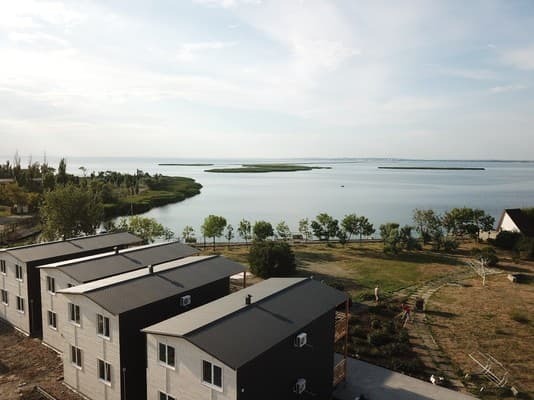 with 2 bedrooms and a large living room with access to the terrace with a magnificent view of the Berdyansk Bay and the city of Berdyansk. The room is equipped with two double beds, a sofa bed, refrigerator, microwave, kettle, air conditioning, TV, fully equipped bathroom. Accommodation of one child under the age of 6 years is free of charge. Additional places on request. Meals are not included in the room rate at Villa Leto. On the beach "Sunny" from 8-00 to 20-00 there is a cafe-bar, where you can taste delicious and inexpensive. Also within a radius of 800 meters there are many cafes and restaurants for every taste. 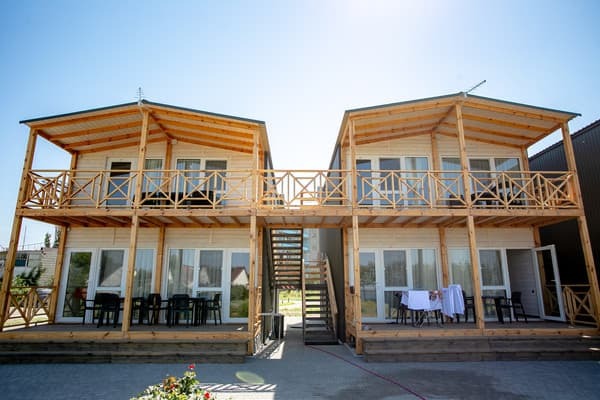 The hotel "Villa Leto" is located in the heart of the Berdyansk spit on the part of the Berdyansk Gulf. In 200 meters from the hotel there is one of the best beaches of the city - the beach "Sunny". Treatment is not included in the price. 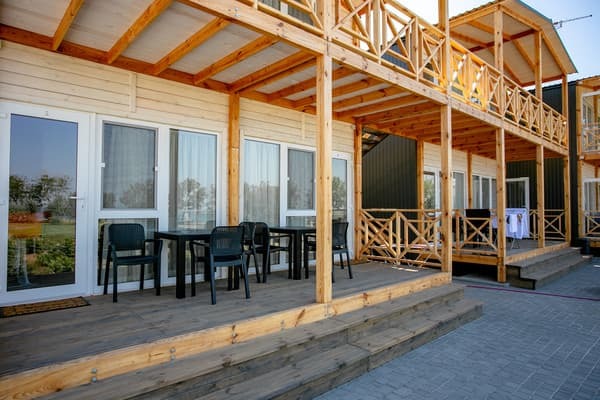 At a distance of 1 km there is a health-improving boarding house "Arktika", which provides a whole complex of medical and recreational procedures.